AppleInsider is reporting the new 13-inch MacBook Pro (s aapl) will include a 2.3GHz Core i5 (s intc) processor, 4 GB of DDR3 RAM, a 320 GB HDD, and a 13.3-inch display with a resolution of 1280×800. Graphics duties will be handled by an Intel HD Graphics 3000 integrated card, and it’ll also sport a rebranded FaceTime HD camera. The 13-inch Pro is also rumored to introduce SDXC support, and a new high-speed data port/display connector dubbed “Thunderbolt,” based on Intel’s Light Peak technology. The specs are supported by a shot of the MacBook Pro box posted by Fscklog that is said to depict the specs of the 13-inch MacBook Pro. 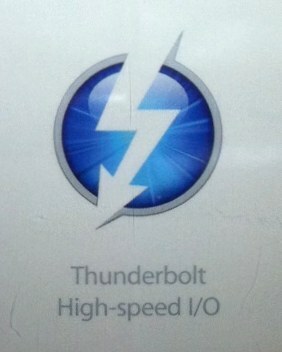 Both AppleInsider and Mac4Ever have also received photos which show the new branding for the Thunderbolt High-speed I/O port. There’s also an image which claims to show the new Thunderbolt port, which, if the photo is accurate, looks exactly like Apple’s Mini DisplayPort on current machines. This makes sense, since the new tech is supposed to be backward-compatible with Mini DisplayPort connectors. MacRumors claims to have separately confirmed that these are indeed legitimate images and specs, and that they depict the configuration of the low-end, 13-inch MacBook Pro configuration. Meanwhile, SlashGear is reporting the higher-end 13-inch MacBook Pro will get a third USB port, along with the option to go with a matte screen capable of 1440×900 resolution. The 15-inch model will apparently be able to handle 1680×1050, and weigh 200g less than the previous iteration. The new 17-inch MacBook Pro will actually be gaining weight, 300g, to be exact, and have 8GB of RAM standard, according to SlashGear. Battery life is said to be increasing to between 11 and 12 hours, depending on the model. These new rumors, especially those concerning the 13-inch MacBook Pro, seem to be standing on fairly solid ground. If Apple is indeed intending to reveal new machines on Thursday, and if they go on sale the same day, then it’s likely retailers are already in position of the new models, so the possibility of a genuine leak is quite high. There’s also the fact that Intel is planning to announce Light Peak at an event Thursday, timing which seems too perfect to be coincidental. The inclusion of Light Peak tech as Thunderbolt also makes a lot of sense, since it appears to be backward-compatible with Mini DisplayPort tech. That means the general population will continue to use it as a display connector, while tech enthusiasts and early adopters can take advantage of its I/O capabilities. And, if Apple is building Thunderbolt into the next iPad, as rumors that it might include a Mini DisplayPort-sized opening suggest, it could make for lightning-quick transfers and syncs between desktop and iOS devices down the road.